So I decided to keep these updates going past the 1 year mark. I mean, why not? It's not like Mason and I have much else going on ... I kid I kid. Call me crazy but I consider these monthly posts to be a good update for family and friends who want to see how my little monster is doing. Where to begin ... well the past month has been quite the transformation from "baby" status to "toddler" status. We stopped breast feeding entirely and Mason spent his first 24 hours without mom. I think I was more torn up about the separation than Mason was. He's walking more and more ... but I can't say he's a walker yet. And while we're on the subject ... if one more person tries to tell me that "it's ok that he's not walking yet" I'll punch them in the face. Seriously. 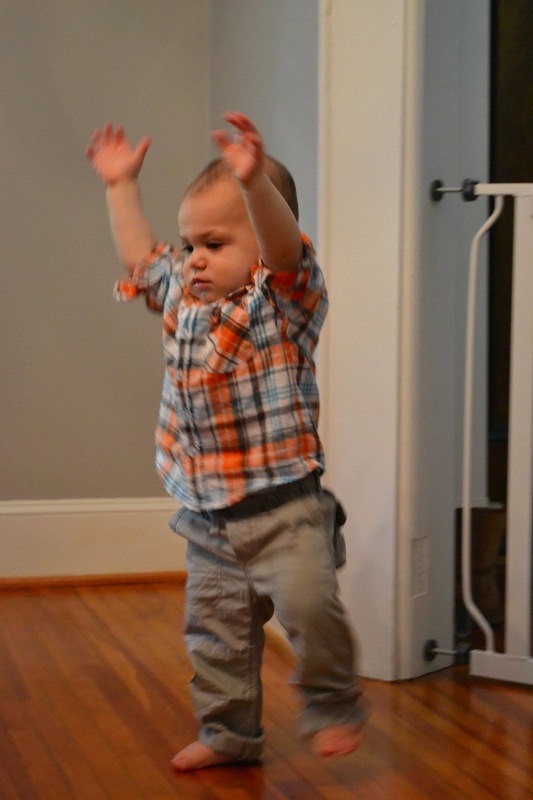 I don't need someone to tell me condescendingly their opinion on my son's walking status. I KNOW it's ok that he's not officially walking yet dummy. So leave me alone and try to parent your own child. Clearly there's a story behind this and the blog is not the place to get into it. We graduated from the stitched or pinned on ties and went with a big boy clip on tie. That's right folks, for the next year he'll be wearing this smashing blue tie with green sailboats. Only the best for my son. His personality shines through more and more each day. Lucky for me his personality is full of goofiness and laughter. I love that I see a little bit of me in him everyday. Honey and Mason are still best friends ... they have quite the understanding during meals. Mason throws food on the floor and Honey cleans it up. Unfortunately for Honey, Mason has been throwing less food on the floor and eating almost all of it. See? He's a walker ... but not in the zombie sense, don't worry. 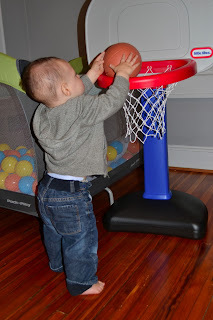 Since entering toddlerhood the kid has definitely gained a lot more confidence. He's clearly a daredevil which is exciting and worrisome all at the same time. I die. Look at that face. Who does he look like more? My money is on MOMMY!